In addition to studying traditional textiles around the world, Jack Lenor Larsen firmly believed in investing in the future, and in devoting resources to developing new textile technologies. He frequently use-tested his latest fabrics in his own home. “Every year at my Gramercy Park apartment I redesigned the interior as a means of experimenting with the cloths we were developing,” he wrote in his 1998 autobiography, Jack Lenor Larsen: A Weaver’s Memoir. These experiments were frequently covered in the design press, including a 1968 article in the New York Times Magazine featuring Larsen’s newly-created “sculpted interior.” Nearly all of the fabrics used were stretch knits: the arched forms of the walls were made from white fabric stretched over wooden frames, and the furniture was covered in printed stretch Caprolan fabrics Larsen had developed especially for upholstering furniture with rounded forms. A more public showcase for these unique fabrics was created at Larsen’s 59th Street showroom, in collaboration with the Dutch furniture manufacturer Artifort. An earlier Larsen experiment in stretch upholsteries met with middling success in the market, because very few furnishings required them. But curvaceous furnishings were being made in Italy, France and the Netherlands, and Larsen negotiated with Artifort to use his new fabrics on a collection of sensuous seating pieces by French designer Pierre Paulin. 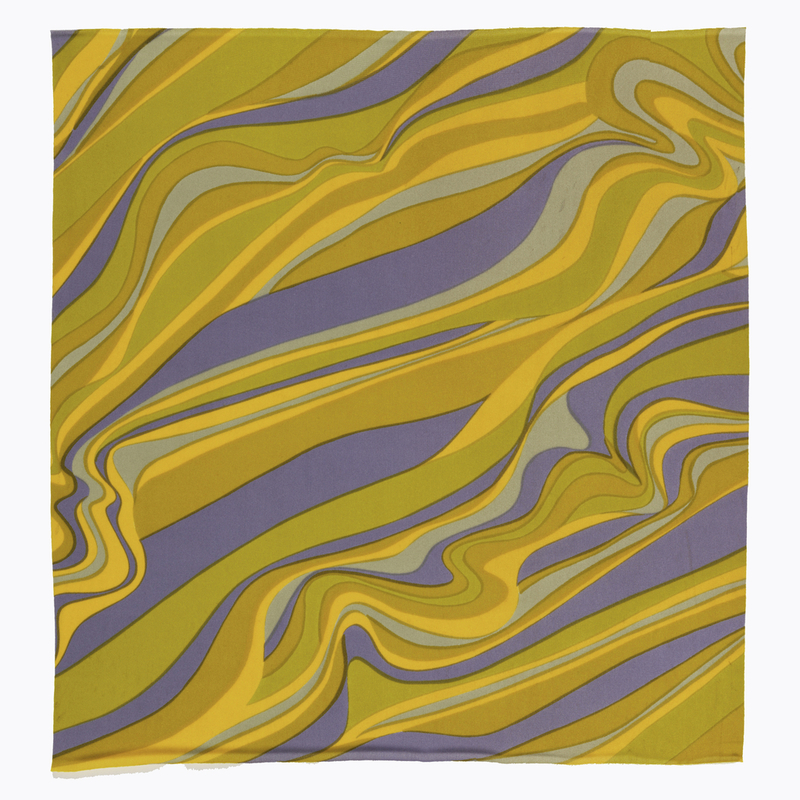 Larsen’s psychedelic colors and undulating patterns emphasized the newness of Paulin’s forms. “The wedding of the sinuous, brilliantly colored prints with the sculptured furniture is so successful that it is hard to imagine one without the other,” the Times said. Sample, Bojangles, 1967. caprolan nylon, polyester foam. Gift of Jack Lenor Larsen. 1968-47-1-c.